When it comes time to relax in your outdoor area, RC Willey knows what you want with this 3 piece outdoor patio set from the Tortola collection. 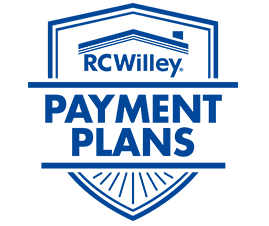 With a durable construction on the wicker frames and the weather-resistant cushions, you can know that you are investing in a patio set that will last. Gather your family and friends and plan a night of socializing and fun with this new set from RC Willey today! Wicker coffee table not included, but available for purchase separately. 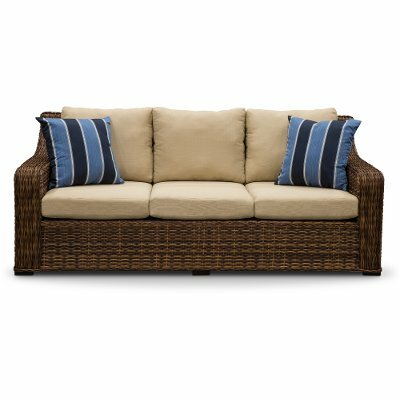 This comfortable outdoor patio sofa from RC Willey looks great and has a quality construction that is built to last. The aluminum and wicker frames and the weather-resistant cushions will give you peace of mind that you are investing in a patio sofa that will last. With the included toss pillows, you can have that extra comfort wherever you want it. Add some extra seating to your patio area today! When you spend time outside, you want it to be comfortable, so RC Willey has you covered with this oversized outdoor patio chair from the Tortola collection. With a durable construction on the wicker frames and the weather-resistant cushions, you can know that you are investing in a patio chair that will last. The included toss pillow gives you extra comfort wherever and whenever you want it. Add some extra seating to your patio area today! 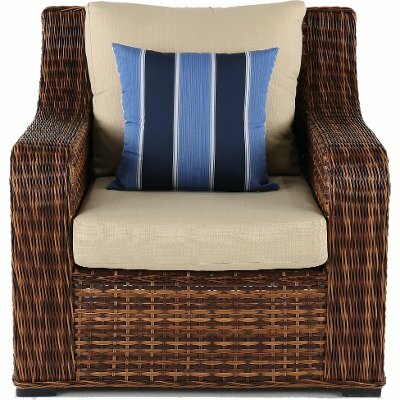 RC Willey has this swivel outdoor patio wicker chair that is comfortable and built to last. With a durable construction on the wicker frames and the weather-resistant cushions, you can know that you are investing in a patio chair that will last. With the included toss pillow, you can have that extra comfort wherever you want it. Add some extra seating to your patio area today! Care Instructions Clean with mild soap and water. 3 Piece Linen Outdoor Patio Set - Tortola is rated 5.0 out of 5 by 2. Rated 5 out of 5 by Schrade Spacious We have had this a month. Bought 2/19, No Assembly required. Delivery was great. My dog got some dirt on it , but cleaned off well. I like the space of the chairs and its built well. Corners on bottom have wood blocks , so not to ruin wicker. Rated 5 out of 5 by Poolside Beautiful! Great quality set, looks beautiful and comfortable to sit in!